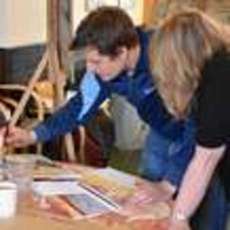 Join artist Peter Tinkler on a Thursday evening for some relaxed drawing and painting techniques in the beautiful surroundings of St Paul's church in the Jewellery Quarter. Students can choose to sign up for 4, 8, or 12 weeks, and the classes are suitable for beginners, intermediate, or advanced. Each week we'll look at a new medium, step-by-step, in an informal, fun atmosphere. Techniques such as drawing with pencil, charcoal, pastel, and ink will be explored, demonstrating how different marks can create texture and depth. Painting mediums such as acrylic and watercolour will be introduced, showing students a variety of brushes and their effects, on themes ranging from portraits, landscapes, still life's and much more. Students can go at their own pace, individual advice and tips are given, and all materials are provided. For any further info please visit the website.